Keywords: Cervical cancer, Screening, Visual inspection with acetic acid, Visual inspection with Lugol′s iodine, paramedical. The main problem of VIA and VILI is the subjective nature of the tests. There are different criteria for defining positivity. Proper training of paramedical staff and even doctors is required if one is to use stringent criteria such as those devised by the International Agency for Research on Cancer (IARC), but these are more specific. On the other hand, using less stringent criteria where any white lesion would be considered positive increases the sensitivity of the test. This is important in rural settings if the test is expected to be performed by paramedical workers and the aim is to minimize the false negatives. But often this is accompanied by unacceptably high rates of false positivity and less positive predictive values. A large number of women labelled positive will require subsequent referral, which will again be a problem in a low resource setting. In India, even doctors in primary or community health centres may need to rely on these visual inspection techniques for primary screening because of lack of available facilities for cytology and colposcopy. The purpose of this study was to assess the test performance of visual inspection techniques by a doctor and a nurse and to see feasibility and efficacy of training a paramedical worker in visual inspection techniques in high-risk women by assessing the concordance of results with the observation of a doctor, using both VIA and VILI. This cross sectional study was carried out in the Gynaecology outpatient department of the All India Institute of Medical Sciences (AIIMS), New Delhi from January through April 2003. Ethical clearance for the study was obtained from the Ethics Committee of AIIMS. In the preparatory phase of the study, both the nurse and doctor received training for one month. Training consisted of didactic teaching on the anatomy and pathophysiology of the cervix, extensive review of photographs of normal and abnormal cervices and supervised hands-on clinical examination, with the aim that they should be able to accurately identify all cases of cervical cancer and at least 85% of precancerous lesions correctly. Patients presenting with complaints of persistent vaginal discharge, intermenstrual bleeding, post coital bleeding or with an unhealthy cervix on examination were invited to participate in a cancer-screening programme. Exclusion criteria were as follows: women less than 30 years of age; prior hysterectomy or procedure on cervix; unmarried; pregnancy; and obvious growth on cervix. Informed written consent was taken. Enrolment questionnaire was completed. The patients underwent Pap smear, pelvic examination, VIA and VILI in this screening order. VIA and VILI were carried out both by a doctor (gynaecologist) and a trained nurse. Randomization was done to determine who would do VIA first. VIA was carried out by applying 5% freshly prepared acetic acid on the cervix and read after 1 minute. VILI was done after VIA after applying Lugol's iodine, which was prepared as follows: 6 g of potassium iodide was added to 100 ml distilled water and 4 g of iodine crystals added and mixed well. Observations were independently recorded by the doctor and nurse without disclosing their findings to each other, using the criteria laid down by IARC [Table - 1]. Later, a second gynaecologist who was blinded to the results of VIA and VILI performed colposcopy. Biopsy was taken from all abnormal lesions. Using the histological diagnosis of high grade lesion or invasive carcinoma as gold standard, the sensitivity, specificity, positive predictive value, negative predictive value and diagnostic accuracy of VIA and VILI was calculated separately for doctor and nurse. The test characteristics for VIA and VILI between doctor and nurse were compared using chi-square or Fisher's exact test, as appropriate. 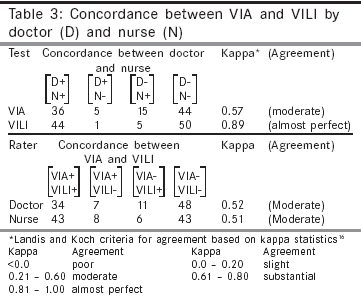 Concordance of results of VIA and VILI between doctor and nurse and with doctor and nurse was determined by kappa statistics, which is percent agreement corrected for chance. For interpretation it was categorised on ordinal scale. One hundred women were enrolled and underwent VIA and VILI by the doctor and nurse. The median age of women enrolled in the study was 36 years (range 30-74), with 64% belonging to the age group of 30-39 years. Thirty five percent had no formal education. Some primary education was present in 13% of women and 52% of women received high school or higher education. Majority of women belonged to lower (46%) and middle (50%) socio-economic classes. One-third of women (33.3%) had 4 or more vaginal deliveries. Mean age at first coitus was 19 + 3.3 years. VIA was positive in 41 cases by the doctor and in 51 cases by the nurse. VILI was positive in 45 cases by the doctor and 49 cases by the nurse. The test characteristics for both VIA and VILI between doctor and nurse were statistically comparable (P > 0.05) and are presented in [Table - 2]. VIA positive both by the doctor and nurse was present in 36 cases, VILI positive by both doctor and nurse was present in 44 cases [Table - 3]. There was moderate agreement (k=0.57) between VIA findings between the doctor and nurse and almost perfect agreement (k=0.89) between the VILI findings. Both VIA and VILI were positive in 34 cases by the doctor (k=0.52) and in 43 cases (k=0.51) by the nurse. Colposcopy guided biopsy was carried out in 60 cases. Histologically confirmed lesion > CIN was found in 10 cases (CIN1 - 2; CIN 2 - 3; CIN 3 - 3; invasive cancer - 2). VIA was positive in 9 of these cases by the doctor. One case of CIN 2 was missed by the doctor and one case of CIN 1 was missed by the nurse. When sensitivity was calculated with high-grade lesions (CIN 2, 3) and cancer as the gold standard, the sensitivity of VIA by the doctor and the nurse was 87.5% and 100% respectively. The sensitivity, specificity, PPV and NPV are shown in [Table - 3]. 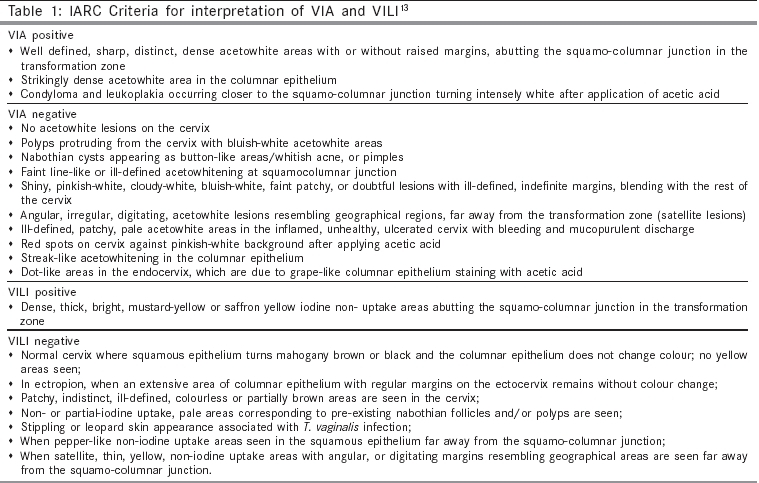 Among the various criteria for VIA negative [Table - 1], significant difference was seen in the interpretation of ill-defined acetowhite areas (P=0.03). The doctor considered this as the finding in 16/61 (27.1%) VIA negative cases, whereas the nurse rated only 5/27 (10.2%) cases as VIA negative and considered the rest to be well-defined and therefore VIA-positive. In all other categories, there was good correlation between the doctor and nurse. The feasibility of introducing low resource methods for cervical cancer screening by training paramedical workers in visual inspection has been the subject of debate for over a decade.,,,,, A few studies have compared the performance of doctors and paramedical workers. Bhargava et al found overall 89.6% agreement between the findings of a paramedical worker and a gynaecologist in a hospital-based study on clinical downstaging of cancer cervix. Similarly, Nene et al (1997), found good concordance between the findings of the paramedical worker and the gynaecologist both with lesser and greater strictness of criteria, using unaided visual inspection of the cervix in the general population. The application of acetic acid improves the recognition of lesions. Different criteria have been used by various groups of workers. Denny et al categorised the appearance of the cervix on direct visual inspection with acetic acid (DVI) into 5 types: suspicious lesion, definite lesion, non-confluent scattered lesion, ill-defined lesion and no lesion. When any lesion was considered DVI positive, the sensitivity of the test for detection of high-grade lesion was 70% and specificity 79.3%, whereas when only definite lesions (as in the present study) were considered the benchmark for positivity, the sensitivity for detection of high-grade lesions fell to 58.3% but specificity increased to 83.5%. In this study, we compared the observations by a trained doctor and nurse using the criteria described by IARC, which are more stringent than those described above. Even after using stringent criteria, there were more false positive results for VIA by the nurse compared with the doctor. The main difficulty was in the interpretation of ill-defined acetowhite areas on the cervix. In the biopsy proven case of CIN 2, which was missed by the doctor, VIA was rated negative because the acetowhite areas on the cervix were considered ill-defined although the nurse had described these as well defined and therefore was marked positive. The case of CIN 1 that was missed by the nurse was marked negative because she thought the acetowhite areas in the columnar epithelium were streak-like, although the doctor found these to be well defined. If Denny's criteria had been followed in the present study and all white lesions considered positive, the sensitivity would have increased further but with reduction in the positive predictive value of the test. This is an important programmatic consideration as this would lead to an unacceptably high burden of referrals for further disease characterisation. Given the large number of women who are eligible for testing in India and other developing countries, the logistics of training and appointing personnel to carry out visual inspection on all women are also daunting. The present study was carried out to explore the performance of these tests when applied to women who are at higher risk for cervical cancer. Even in this setting the results are in accord with other studies, where visual inspection of the cervix after application of acetic acid is associated with a high sensitivity but low specificity and positive predictive values for high grades of CIN and invasive cancer., VILI results had lesser diagnostic accuracy when compared with VIA in case of the doctor, but for the nurse both VIA and VILI had similar test performance. Since VILI was performed after VIA by the same person, the results of VILI could be biased by the VIA results. However, this will not affect the primary objective of the study, that is to assess the correlation between the VIA results by the nurse and doctor. The results of this pilot study indicate no added advantage of performing VILI after VIA in low resource settings. In conclusion, visual inspection by acetic acid using stringent criteria is an effective screening test. The colour changes produced by VILI are more dramatic and may be easier to interpret for a paramedical worker. Medical and paramedical workers can be easily trained to perform these tests with acceptable accuracy. Proper training of personnel is essential to minimise false positive results. 1. Chou P, Chen V. Mass screening for cervical cancer in Taiwan from 1974 to 1984. Cancer 1989;64:962-8. 2. Lazcano-Ponce EC, Rascon-Pacheno RA, Lozano-Ascenio R, Velasco- Mondragon HE. Mortality from cervical carcinoma in Mexico. Impact of screening, 1980-1990. Acta Cytol 1996;40:506-12. 3. Sehgal A, Singh V, Bhambani S, Luthra UK. Screening for cervical cancer by direct inspection. Lancet 1991;338:282. 4. Singh V, Sehgal A, Luthra UK. Screening for cervical cancer by direct inspection. BMJ 1992;304:534-5. 5. Basu P, Mandal R, Roy C, Das P, Choudhury D, Datta K, et al. Evaluation of downstaging in the detection of cervical neoplasia in Kolkata, India. Int J Cancer 2002;100:92-6. 6. Belinson JL, Pretorius RG, Zhang WH, Wu LY, Qiao YL, and Elson P. Cervical cancer screening by simple visual inspection after acetic acid. Obstet Gynecol 2001;98:441-4. 7. Wesley R, Sankaranarayanan R, Mathew B, Chandralekha B, Begum AA, Amma NS, et al. Evaluation of visual inspection as a screening test for cervical cancer. Br J Cancer 1997;75:436-40. 8. Megevand E, Denny L, Dehalck K, Soeters R, Bloch B. Acetic acid visualization of the cervix: an alternative to cytologic screening. Obstet Gynecol 1996;88:383-6. 9. Nene BM, Deshpande S, Jayant K, Budukh AM, Dale P, Deshpande DA, et al. Early detection of cervical cancer by visual inspection: a population-based study in rural India. Int J Cancer 1996;68:770-3. 10. Ottaviano M, La Torre P. Examination of the cervix with the naked eye using acetic acid test. Am J Obstet Gynecol 1982;143:139-42. 11. Sankaranarayanan R, Wesley RS, Somanathan T, Dhakad N, Shyamalakumary B, Sreedevi AN. Visual inspection of the uterine cervix after the application of acetic acid in the detection of cervical carcinoma and its precursors. Cancer 1998; 83:2150-6. 12. University of Zimbabwe/JHPIEGO Cervical Cancer Project. Visual inspection with acetic acid for cervical cancer screening: test qualities in a primary-care setting. Lancet 1999;353: 869-73. 13. Sankaranarayanan R, Wesley RS. A practical manual on visual screening for cervical neoplasia. Lyon, France; IARC Press; 2003. p.15-35. 14. Denny L, Kuhn L, Pollack A, Wright TC Jr. Direct visual inspection for cervical cancer screening. An analysis of factors influencing test performance. Cancer 2002;94:1699-707. 15. Clinical epidemiology. In: Fletcher RH, Fletcher SW, Wagner EH, eds. The essentials. 2nd edn. Baltimore, MD: Williams and Wilkins; 1988. p. 46-7. 16. Landis JR, Koch GG. The measurement of observer agreement for categorical data. Biometrics 1977;33:159-74. 17. Bhargava VL, Verma K, Sharma R, Batra S, Anandalakshmi PN. A hospital based study on the use of paramedical personnel for clinical down staging of cancer cervix. Indian J Med Res 1993;98: 65-8. Hillmann, E.D.C. and Dos Reis, R. and Monego, H. and Appel, M. and Hammes, L.S. and Rivoire, W.A. and Capp, E.
Ajenifuja, K.O. and Gage, J.C. and Adepiti, A.C. and Wentzensen, N. and Eklund, C. and Reilly, M. and Hutchinson, M. and Burk, R.D. and Schiffman, M.
Ghosh, P. and Gandhi, G. and Kochhar, P.K. and Zutshi, V. and Batra, S.
Swaminathan Iyer, K. and Gaikwad, R.M. and Woodworth, C.D. and Volkov, D.O. and Sokolov, I.
Singla, S. and Mathur, S. and Kriplani, A. and Agarwal, N. and Garg, P. and Bhatla, N.
Sherigar, B., Dalal, A., Durdi, G., Pujar, Y., Dhumale, H.
Murillo, R., Luna, J., Gamboa, O., Osorio, E., Bonilla, J., Cendales, R.
Gaikwad, R., Iyer, S., Guz, N., Volkov, D., Dokukin, M., Sokolov, I., Woodworth, C.D. Qureshi, S., Das, V., Zahra, F.
Muwonge, R., Manuel, M.D.G., Filipe, A.P., Dumas, J.B., Frank, M.R., Sankaranarayanan, R.
Mofrad, M.H., Esmaeili, H., Tabaee, S.
Iyer, S., Woodworth, C.D., Gaikwad, R.M., Kievsky, Y.Y., Sokolov, I.
Bhatla, N., Gulati, A., Mathur, S.R., Rani, S., Anand, K., Muwonge, R., Sankaranarayanan, R.
Ahmed, T., Ashrafunnessa, Rahman, J.
Arbyn, M., Sankaranarayanan, R., Muwonge, R., Keita, N., Dolo, A., Mbalawa, C.G., Nouhou, H., (...), Basu, P.
El-Shalakany, A.H., Saeed, M.M., Reda Abdel-Aal, M., El-Nakeeb, A.H., Noseirat, N., Ayyad, S.B., El Din, Z.S. Christe, D.M., Mohanambal, M., Ramamurthy, V., Snehaa, N.B. Muwonge, R., Walter, S.D., Wesley, R.S., Basu, P., Shastri, S.S., Thara, S., Mbalawa, C.G., Sankaranarayanan, R.
Kamal, M.M., Sapkal, R.U., Sarodey, C.S., Munshi, M.M., Alsi, Y.D., Chande, M.A., Hingway, S.R., (...), Kulkarni, H.
Elit, L., Baigal, G., Tan, J., Munkhtaivan, A.
Sodhani, P., Gupta, S., Sharma, J.K., Parashari, A., Halder, K., Singh, V., Sehgal, A.
Sangwa-Lugoma, G., Mahmud, S., Nasr, S.H., Liaras, J., Kayembe, P.K., Tozin, R.R.,Drouin, P., (...), Franco, E.L.
Iyer, S., Kievesky, Y., Woodworth, C.D., Sokolov, I.
Moore, M.A. and Tajima, K.